The folks at Biltmore are outdoing themselves once again with the Biltmore Flower Carpet. 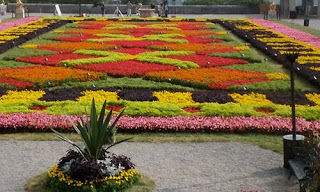 Starting August 14 through the end of the month, the South Terrace of Biltmore House will have more than 100,000 plants arranged into an artistic “carpet” of color. Yes, that’s right: 100,000 plants. From Biltmore’s website: This year’s design was created by a Biltmore employee (Rachael McIntosh from the Bistro) and was interpreted from stone carvings, interesting lines, and intricate details from around Biltmore House. Most notably, the design reflects a fleur-de-lis motif found on a stone pillar outside Biltmore House. These pillars were inspired by the Chateau de Blois in the Loire Valley of France. Viewing the Biltmore Flower Carpet by day is included in the price of daytime admission. Guests of our Bed & Breakfast near Black Mountain can purchase daytime admission tickets at a $10 discount off the gate ticket price, and those tickets are good for two consecutive days. We are located 20 minutes east of the entrance to Biltmore Estate. Additionally, on Fridays, Saturdays and Sundays, you can view the carpet in the evening with admission to the grounds at 4:30pm, a self-guided candlelight tour through Biltmore House from 5pm to 8pm, live jazz music, plus daytime access to Biltmore Estate the next day. The cost for Flower Carpet Evenings is $65 and is purchased directly through Biltmore Estate.